Time to Celebrate Women’s History Month and Gloria’s 80th Birthday! Today is the first day of March and also the first day of Women’s History Month. The entire month of March will be dedicated to not only celebrating the accomplishments of incredible women, but also bringing forth both the opportunities and the challenges we face in achieving even greater gender balance. In the United States, Women’s History Month has its roots in International Women’s Day (March 8th), but it wasn’t until Congress passed a resolution in 1987 designating March as Women’s History Month that the current initiative was begun. This year’s theme is “Celebrating Women of Character, Courage, and Commitment”, and I can’t think of a better theme for this particular Women’s History Month, because it is a special one indeed. On March 25th, 2014, Gloria Steinem is turning 80 years old, and I for one can’t wait to celebrate this incredible milestone. Gloria is a true pioneer in the quest for gender equality, and she has remained an eloquently vocal advocate for the advancement of women and girls for decades. A journalist, activist, and proud feminist, Gloria’s contributions to the social, political, and economic status of women cannot be overstated, and as a prominent leader of the feminist rights movements of the 1960s and 1970s, Gloria, along with her many other pioneering sisters, helped to pave the way for many of the rights and freedoms women often take for granted today. I am honoured and privileged to call Gloria a friend of mine, and I am humbled by the fact that at 80 years old, she continues her work so passionately. To say she is a constant source of inspiration to me would be a complete understatement. Anyone who knows Gloria, knows that she will be the first person to deflect any praise, and therefore she will probably hate the fact that people are making a big deal out of her birthday. But I don’t care! Her accomplishments are simply too great to not celebrate, and I know that I for one am looking forward to celebrating with her on multiple occasions! One such opportunity is to attend the MS. Foundation Annual Gala in New York on May 1st. It will be a blast! I will also be tweeting out my top Gloria quotes all month, once a day until her birthday, and you can follow along at @JackiZehner or at #wwgd (What would Gloria do? This hashtag was launched at the recent MAKERS conference). In full Gloria fashion I invite you to join with me and celebrate amazing women who have made a difference to create a more just and balanced world. You can follow the conversation all month on Twitter at #whm2014 ( Women’s History Month 2014) , and I encourage everyone to join in the conversation. March will be an amazing month, full of stories of incredible women, the marking of their accomplishments, and a celebration of one truly awe-inspiring woman. I wish everyone a very happy Women’s History Month, and I can’t wait to read all of your stories. To Gloria… you are loved and respected beyond words. Thank you for all you do and all you are. Happy 80th Birthday Month! * Photo was take at my going away party from New York in 2010. 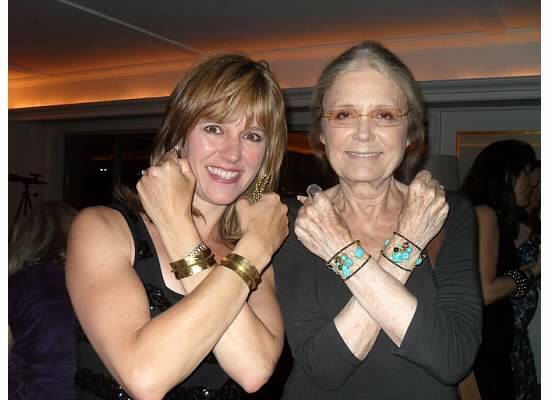 Gloria gave me those amazing cuffs as I am a huge Wonder Woman fan. You may notice that Gloria often wears two and is one of the world’s experts on WW. In fact, the very first issue of Ms. Magazine had WW on the cover (1972).